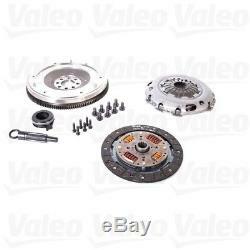 Clutch Flywheel Conversion Kit-Conversion Clutch Kit fits 02-08 Mini Cooper. Key Note : Conversion Kit that Includes a solid flywheel that will replace the original equ. Marketing Description - 2000 : Valeo Conversion Kits offer a high performing and efficient aftermarket solution for replacing the Dual Mass Flywheel (DMF). This innovative solution replaces the DMF with a solid flywheel and places the long travel dampers into the clutch disc. This converts it back to a standard clutch. Valeo Conversion Kits are engineered and manufactured to be an exact fit. Easy Installation: The same installation time as a Dual Mass Flywheel kit - no special tools required; Durable: All new components provide better thermal resistance and full engine gearbox protection; Maximum Torque Transfer: The lightweight kit increases torque transfer efficiency and reduces torsional stress on the crankshaft. Competitive cost savings: Notably reduces the cost of repair when compared to the DMF Kit; Kit contains everything needed to complete the job: Rigid flywheel, flywheel bolts, long travel damper disc, cover assembly, pressure plate bolts, release bearing or CSC and centering tool (available for most popular items). AAIA Part Type Description : Clutch Flywheel Conversion Kit. Country of Origin (Primary) : ES. Harmonized Tariff Code (HTS) : 8708936000. Interchange Part Number : 03-050, 03-055, 3055, 95646SK, BMK1001FW, DMFkit. Label Description - 80 : Conversion Clutch Kit. Life Cycle Status Code : 2. Product Description - Abbreviated - 12 : Conversion. Product Description - Invoice - 40 : Conv. Kit Mini Cooper 1.6L 02-08. Product Description - Long - 80 : Conv. Kit Mini Cooper 1.6 S series 2002 2008. 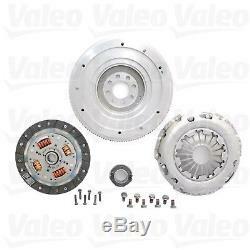 Product Description - Short - 20 : Clutch Kit. See Item Specifics section for additional specifications about this part. To confirm that this part fits your vehicle, enter your vehicle's Year, Make, Model, Trim and Engine in the Compatibility Table. Also review the notes section in the compatibility chart for additional specifications about this part. This part generally fits Mini vehicles and includes models such as Cooper with the trims of John Cooper Works Convertible 2-Door, S Convertible 2-Door, S Hatchback 2-Door. The engine types may include 1.6L 1600CC l4 GAS SOHC Supercharged. This part fits vehicles made in the following years 2002, 2003, 2004, 2005, 2006, 2007, 2008. This item may interchange to the following part numbers from other brands. We are a purveyor of quality new and remanufactured parts for your car or truck. We know how important your vehicle is to you and we are committed to your 100% satisfaction. With over 30 years experience, we are your complete parts source! Portions of the part information on this page have been provided by WHI Solutions, Inc. The item "Clutch Flywheel Conversion Kit-Conversion Clutch Kit fits 02-08 Mini Cooper" is in sale since Thursday, March 3, 2016. This item is in the category "eBay Motors\Parts & Accessories\Car & Truck Parts\Transmission & Drivetrain\Clutches & Parts". The seller is "joxauto" and is located in Pasco, Washington. This item can be shipped to United States, Canada, Mexico.